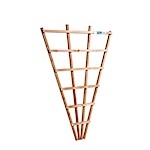 NMI Fence carries a large assortment of decorative Arbors and Trellises. ARBORS Available 42",48" and 60" widths. A Cedar arbor is an inviting feature in your yard. Your arbor can be used as an entranceway or as a focal point in any setting. We offer many options for side panels, as well as the standard 4x4 arch and post, and SWP’s striking 5x5 arch and post. 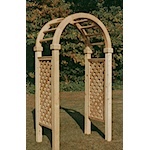 The arbor gate blends naturally with the arbor and is an excellent choice.